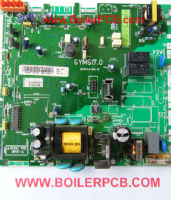 BoilerPCB | Exchange control printed circuit boards for central heating boilers. We provide reconditioned PCBs fully tested - better than buying new - and our PCBs are a fraction of new price ! If you need a PCB that is not yet listed - commercial or domestic - we may have it in stock. We supply only original manufacturer approved PCBs on a reconditioned basis. No copies, pattern spares or parts refurbished by any other companies. Is your old PCB 'Obsolete' ? No problem, we repair many obsolete PCBs., Send us your faulty PCB and when it arrives, we will repair, test and return yours. We take great pride in our quality of service and speed of delivery; please see our customer feedback page. Choose your items and place in your shopping basket. Proceed to the checkout and make your payment securely with a debit or credit card. Print a copy of your order and enclose it with your old PCB securely packed in a cardboard box. Send using a tracked service to the address on the 'Contact Us' page. BULK PACK of 100 CXI HXI SXI 12 to 30 later version 2000802731 ONLY £30 EACH!